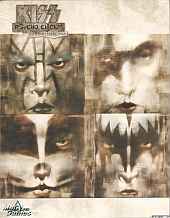 This game, probably which by its license (the group Kiss, whose 4 members one in the course of the game embodies) deterred more players from trying it than attracted. But, based on Todd McFarlane's (of Spawn fame) spinoff comic book, it offers solid action throughout. Without any room for doubt, having the enemies have a health bar gives you comfort in knowing how tough they are. One knows immediately whether one is able to destroy an enemy and can also measure exactly when they will die. Also with each usable article it is indicated what is possible to do with it - whether one can use it to strike or shoot or use it simply otherwise. The game was programmed by a majority of the crew which was busy with Daikatana before. A little more than 1 year after their jump to a new game, they succeeded in making a solid action game from the ground up which was more fun than the flawed Daikatana (whereby John Romero had maintained that these young programmers were so bad that working with them was nearly impossible). Kiss is based on a modified Lithtech 1.0 engine of Monolith, which recalls thus graphically something of Blood 2. But the opponents are creative though stupid, but that is intended similar as with Doom. Their sole purpose is to kill and rush at you (and as with Doom to defeat the monsters occasionally also you must shoot them from above). Up to 50 characters filling the screen at once‚ the largest number of creatures ever seen at one time on a first-person shooter screen. Whoever is looking for Action without many puzzles, with driving off opponents (and is not deterred by the Kiss characters) has chosen the right game.